The flagship phone features a 5.1-inch full HD screen and Finger Scanner. 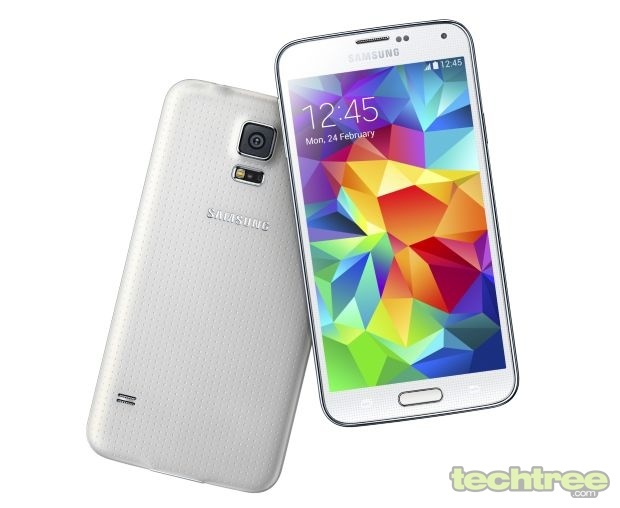 Samsung has finally unveiled one of the most anticipated handset of this year, the GALAXY S5. Now that the details are out, we confirm that the recent leak was bang on! Samsung's flagship phone indeed sports an uninspiring design similar to its predecessor (the company calls it iconic though). The back-panel of the S5 looks as if the S4 has just returned from a acupuncture therapy. What's good to know is that the S5 adheres to (Ingress Protection) IP67 standards. In simple words, the phone is dust and water resistant. The phone features a 5.1-inch AMOLED screen Full HD resolution. The phone is powered by a 2.5 GHz quad-core Snapdragon 801. There's 2 GB RAM, 16/32 GB internal storage, microSD card slot, and 2800 mAh battery. The camera module has been upgraded to 16 megapixel. Samsung claims that the handset has the world's fastest autofocus speed up to 0.3 seconds. The company has also added Selective Focus feature, which is a rip off of Nokia's Refocus app. For those not in the know, this software allows users to focus on a specific object while blurring out the background. The camera is capable of 4K recording at 30 fps. Inspired by the iPhone 5s, Samsung's latest flagship sports a 'Finger Scanner'. This biometric technology will be used for unlocking the phone and for authorising app purchases. The S5 also comes with a unique heart rate monitor, which works with Samsung's S Health 3.0 app suite. The handset offers Android 4.4 Kitkat with Samsung's TouchWiz UI. Samsung hasn't made any significant change to the interface. So it still looks gaudy and cluttered like the previous iterations. The Samsung GALAXY S5 comes in charcoal Black, shimmery White, electric Blue, and copper Gold. The phone's global rollout will begin in March. However, there's no official word on the S5's pricing, but we expect it cost around Rs 50,000 in India.